When I started From the ground up in early 2016 many detractors suggested that I’d have nothing to do across the winter. They could not have been more wrong. Gardening in winter is not only plentiful, but essential. Many jobs can be done in winter, allowing more time for essentials in the spring. Two key winters gardening jobs are pruning back trees, hedges and shrubs, and planting bulbs. We traditionally think of planting bulbs in September, maybe October. God forbid you forget, you can get away with November. But the cold months are different now to the traditional view; winter does not really kick in until December. And even then, the ground is often warm still, and perfectly OK for planting bulbs. This coincides with bulbs suppliers reducing their prices, meaning that you can get twice as many bulbs for your money. There is still that concern that you might not get exactly what you want, so if there is a “must have” selection, order then early and pay the price. Places where any “late red tulip”, or a generic small stemmed daff will do can often be filled cheaply. Just wait for prices to come down. Tulips are able to be planted out later than Daffodills, which can always started in pots under cover. These are ready to be planted out in February – or sink the pot – where there is a gap. if you are planting 10 tulips or crocus then this will matter little. If you are creating a garden for impact, or developing themes year on year then saving time and money really makes a difference. 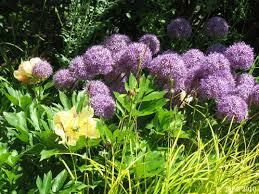 For a few years I have coveted Allium Globemaster, with 20cm globes on robust 1m stems. But at £3 to £5 each form many suppliers I could not justify the cost of creating an impact. In the sale this year 10 bulbs cost just £11, a reasonable cost for adding this element into my plan. But the real gardening in winter is in tree, shrub and hedge care. Gardening guides suggest that many shrubs require pruning in early spring. Again this is subjective, depending on where you are in the country. And how you define spring. But lots of trees need attention while the sap is not rising, including Apples. And many shrubs are preferably pruned while dormant. Rejuvenation pruning, where hard pruning back is required after a period of overgrowth or neglect, is best done between November and March. That fits with the majority of definitions of “before spring”. Fuchsia, Corylus, Leycesteria, Philadelphus, Cotinus and Salix. The only plants that cannot be pruned hard are conifers. These are mostly unable to regrow from old wood. Deciduous hedges should also be pared back now. This is the ideal time to cut back those hedges that have become ever wider. Prune back to a stouter more rigid frame, so the bush can present a softer more manageable face. This will need trimming as new growth gets to two – three buds. And it should be cut to form an upward slant from a slightly wider base. This slanting or “batter” enables light to reach the bottom, allowing more even growth. Doing this gardening in winter should leave more time for the spring essentials, like clearing ornamental grasses, and dead heading day lillies; things that cannot be done at any other time. Restorative or maintenance pruning in winter is done at the expense of future flowering of the shrub, so you could lose some of this year’s flowering. 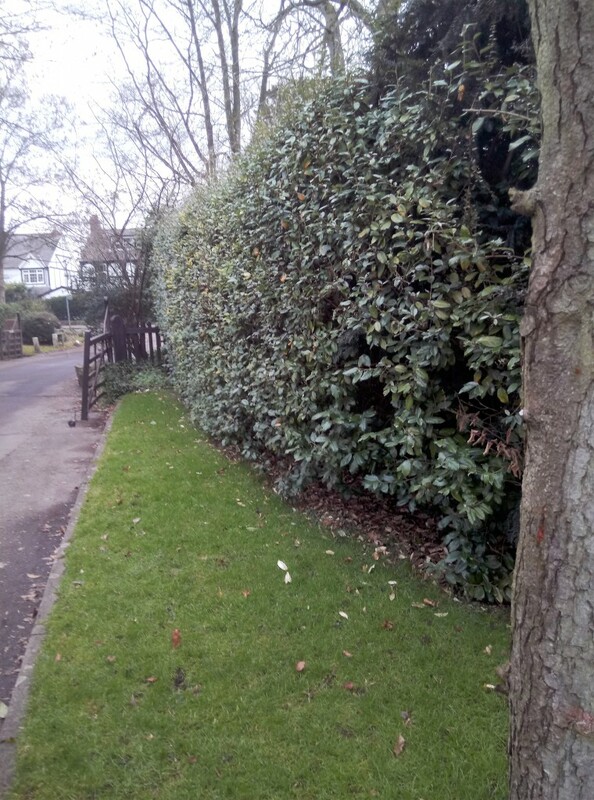 With large shrubs or hedges do it gradually, allowing the chance for recovery. Shrubs should be reduced in stages over two years, and hedges one side at a time, and the height at another time to the sides. A good feed and mulch will help the plants recover. 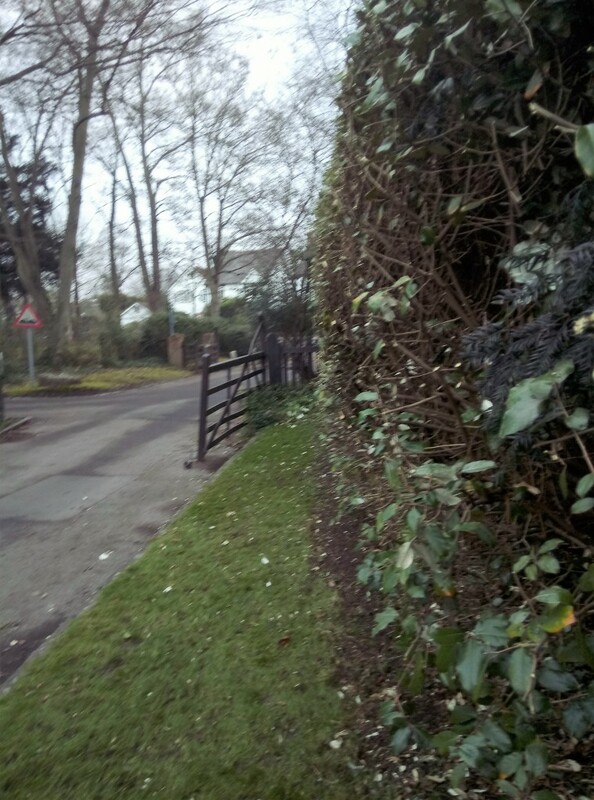 Attending to the hedge sides separately means that it still maintains some integrity. When the side cut back in winter has recovered fully, the other side can then be reduced. This may be the following autumn. Otherwise wait until the gaps have filled in. I have an overgrown elaeagnus that has a few leaves on the very outside of a large empty space. I don’t like it as a hedging plant; it not dense enough. So I am going to cut the outside face back hard. Hopefully it will become dense enough to work as a hedge for both privacy and security. If not I will replace it completely. And you thought there was nothing to do in the garden until spring! But if you want more of you favourite plants, to add to the impact in your beds without spending a fortune, now is the time to consider propagating those with a fleshy root, time to be taking root cuttings. Included are oriental poppies, Acanthus, Echinops and the drumstick primulas. 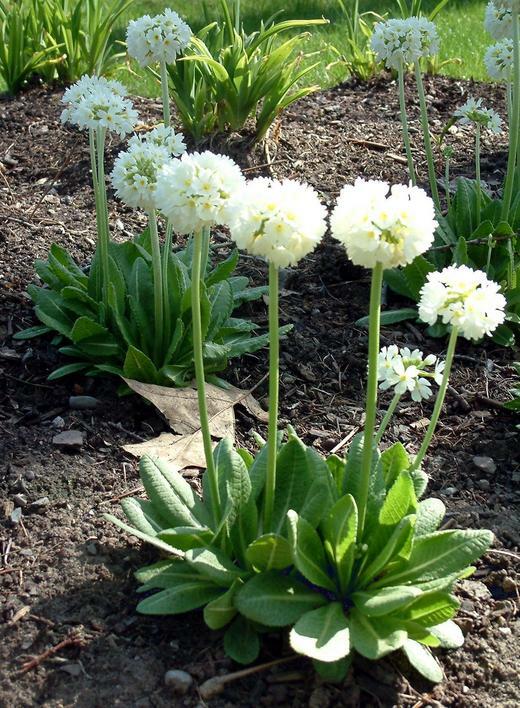 Those are Primula Denticulata, the ones that have a tight cluster of flowers forming a ball at the top of the stem. 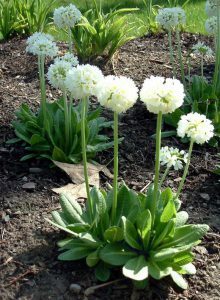 Drumstick Primula. Mine grow on the edge of a shaded area, close to the pond, sharing space with Hellebores and snowdrops. Root cuttings are best taken when the plant is dormant. That may not be so easy to establish, with ground staying warm under a mulch or in a sheltered space. The oriental poppies are notorious for this, and have new growth showing now. This leads you to think that they are growing. Some others you may not be able to see, relying on your memory of where you last saw them to dig them up. I know it seems obvious, but gently dig up the donor pant, and after you’ve harvested the roots, carefully replant it into a hole where you’ve loosened the soil, so as it rains the soil is easily washed around the roots. that way you don’t have to risk breaking roots by firming it in too hard. Take a thick root or two from your donor plant, cut off as close to the plant as possible, and use the parts that are “pencil thick”. Remove any small whispy root attached, and the thin end. You want sections about between 5 and 10 cm long, To ensure they go in the right way up, cut the top flat, and the bottom on a angle. Insert them into a pot of compost, pointed end first. Because the compost needs to be well drained and coarse, start with just a little compost in the pot. My compost is two parts multi-purpose, one part sand and grit. Insert you root cuttings into it, and then fill the pot. Or you can use a pencil or dibber to make a hole to drop the cutting into. More often than not they won’t push into the compost without breaking. Once watered leave in a cold greenhouse or frame until spring. Those that survive can be potted on, and be planted out later in the year. Or at least by next year. If you have some of these plants, you may well ask why not just buy more if you want impact. But most 9cm pots come at about £4-£5 each, plus postage. How many do you need to have some real effect? maybe 7 – 9 smaller plants, 3 – 5 larger ones. But its a nice way to spend an hour exercising your brain and body. And making some more plants will make a nice contribution to your garden and your pocket. 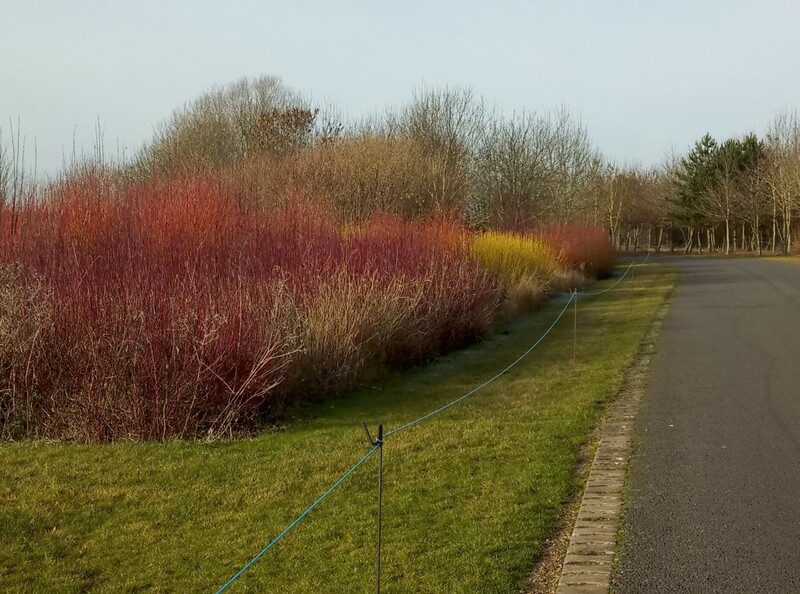 Many gardeners “in the know” will now have borders featuring the coloured stems of dogwood. These vary from deep purple to a whiter shade of pale, with reds, oranges, green and yellow. They know the secret of using dogwood for winter colour. And in the summer these same plants offer strong growth with interesting foliage and flower. Established Dogwood plants are available from garden centres in the spring, but at £12 – £20 each it will be expensive to create the sort of block colour impact that gets them noticed. The best time to buy is early winter, when rooted stems can be bought for as little as £1 each. The more popular varieties, such as Midwinter Fire, will cost more. But the price of bare root canes reduces the more you buy. One of my favourite sources for bareroot and perennials is Buckingham Nurseries. I have used dogwoods for a few years now, both for the colour and for the winter framework. When they are cut back in the spring, the shorter framework provides support for emerging bulbs and perennials. So they earn their keep more than once. A place that offers an idea of the sort of impact these plants provide is Dorney lake. I go there occasionally to drop my boy off to row or cycle, and always stop to look at the flowing banks of colour. It reminds of opening a large set of coloured pencils for the first time, seeing the colour themes grouped together, transforming from one shade to the next. 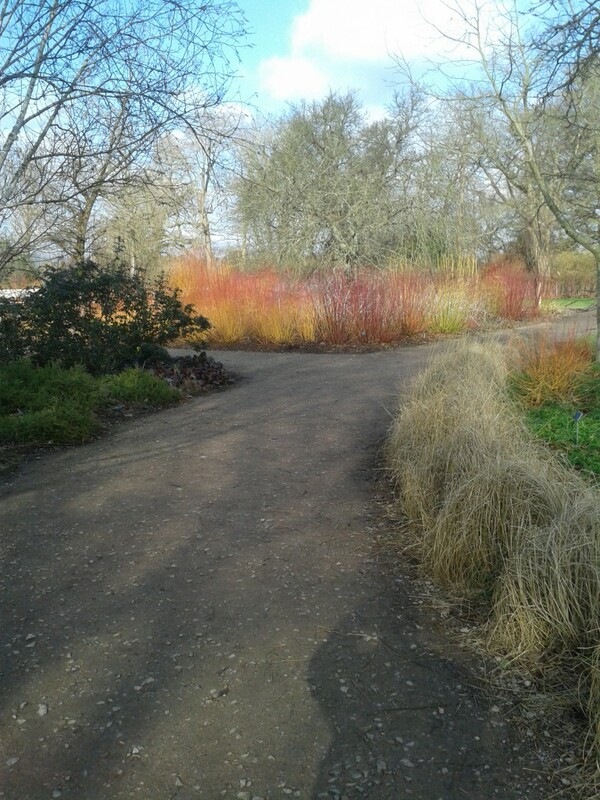 I also like the garden at RHS Wisley, where the dogwoods are planted closer to the water, with paths meandering through. From the opposite side of the pond you can see them reflected in the water, amplifying the intensity of the colour. Both these places use other plants with similar properties to accentuate the effects. 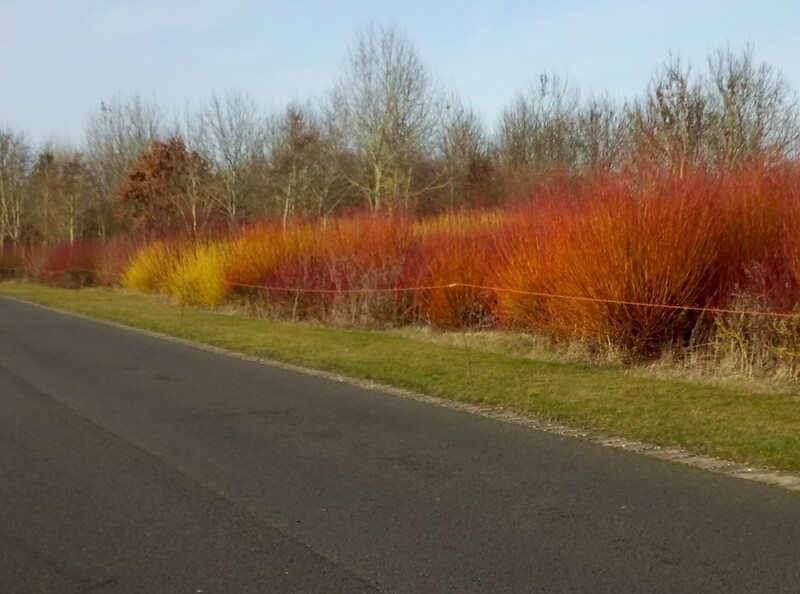 At Dorney a golden stemmed Willow provides intense yellow, while Wisley uses the ghostly Rubus brambles to provide a white foil. Unless you have a significant garden that is likely to be where the large colour block concept ends. But you can use dogwood for winter colour in the smallest garden, using just a few plants. But in order to see the intensity of one colour there needs to be another present, rather like a straight man; Laurel and Hardy, Morecambe and Wise or Barker and Corbett. Using just green or just red won’t do because you can’t see quite how green or red it really is. I use other dogwood colours, or other coloured stems, to provide the contrast, but anything that provides a backdrop will do. The best colour shows on the newest stems. And that implies that you have to cut off the old ones – mostly – every year. Do it while the plant is dormant, normally by the end of February. 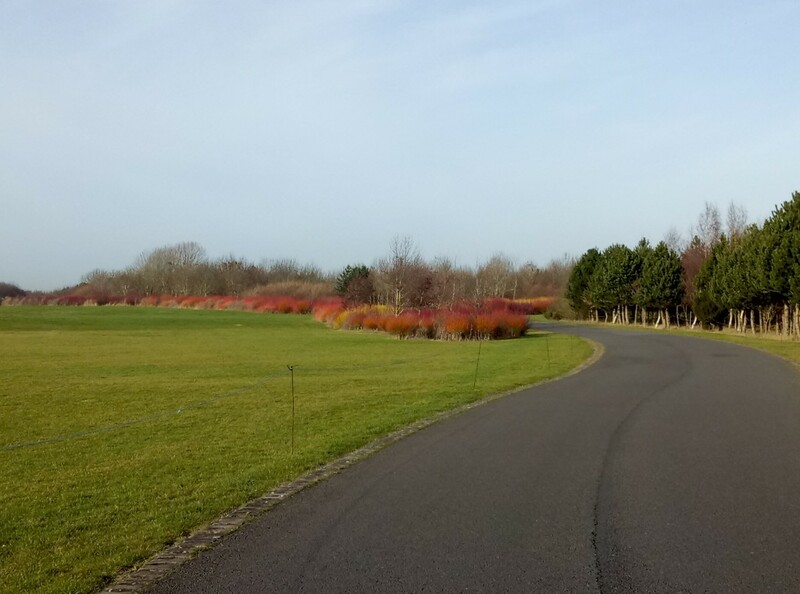 But delaying pruning until later will maximise the colour show. In established plants, wait until the new leaves start to show, then either coppice to a low stump, or pollard for a mid-height effect. The best time to prune for most of us is when you have time to do it. But to get the best result of strong coloured stems next winter, prune before leaf growth really gets going. Make your stem reduction before the plants energy moves to the leaves, or re-growth is impaired. That leaves a window from Late February to late March, depending on how warm it is. Dogwood is a plant group that will enhance any garden, one I can’t contemplate being without. This spring I will show you how to prune your dogwood for winter colour, and what to do with the cut stems afterwards. I use them to create cuttings for more plants, or as cut stems in a tall vase for the hall way or lounge. 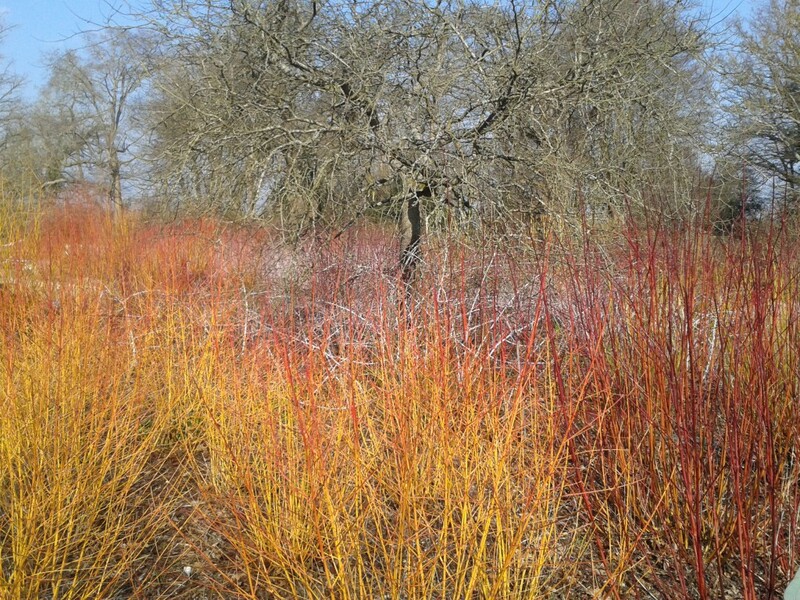 Click here for more on the free Dogwood for winter colour garden workshop.